The Skyliners Drum & Bugle Corps’ Open House this past Saturday was a tremendous success, and an exciting beginning for the corps’ 2017 competitive season. Shane Startzel, Brass Caption Head, assisted by Joe Wilt, Assistant Brass Caption Head, led the brass instruction, supported by 2017 Brass Staff. After warm-ups, the horn line worked through the “Lost Boy” Ballad and the beginning of “Escape from Paradise” from The Skyliners’ 2017 show “XSCAPE”. Front and center was the inaugural use of B Flat System Blue brass by The Skyliners, which caused great excitement and anticipation. Brass Arranger John Meehan sent a special video greeting for Open House attendees. Percussion Caption Head Patsy Vankirk, Front Ensemble Coordinator Dr. Rick Wolfel, and the Percussion staff, led the Percussion through battery and front ensemble warm-ups. The talent level of the ensemble and the incredible interest will no doubt be a driving force for The Skyliners in 2017, and raise the bar even further than 2016. The Color Guard members in attendance were led by Brenda Peregrim, Color Guard Caption Head, James Branch, one of The Skyliners’ Color Guard Designers and staff through stretching, movement, and flag and weapon work. At the end of the day, the guard members performed their routines for fellow corps members, giving the corps a taste of what to expect from this talented group of performers and designers. Jeff Crawford, Visual Caption Head and the 2017 Visual Staff introduced the Visual program to the attendees, working on ensemble and individual elements. A PT session introduced some of the exercises that members will focus on throughout the year, and a structure to an overall fitness program that will help develop and improve skills, fitness and endurance. Keep up-to-date with us via the Skyliners Drum & Bugle Corps Website and join the Skyliners 2017 Interest Page at Skyliners 2017 Interest Facebook Page. 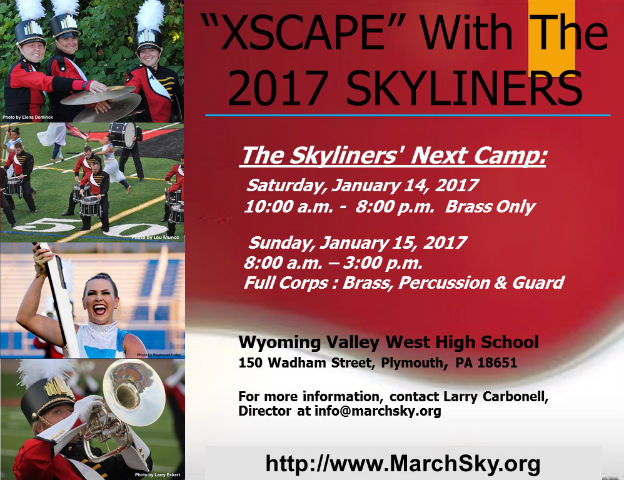 For more information, please contact Larry Carbonell, Director director [at] marchsky [dot] org or go to Skyliners 2017 Join Page to follow the directions and create a CorpsData profile. Posted by News Editor on Friday, December 9th, 2016. Filed under DCA News, FrontPage Feature.